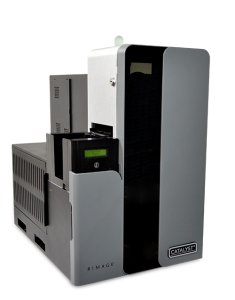 Rimage Catalyst™ disc publishing systems offer industrial grade hardware, front-office friendly design and professional quality disc production, an ideal choice when high-volume production is not required. The Catalyst system comes standard with and Everest® or a Prism III™ printer and, a fit for any IT environment, can be ordered with or without an embedded PC. Catalyst Product Tour from Rimage Corporation on Vimeo. Catalyst systems, with the world’s best full-color and thermal monochrome disc printers, provide top-of-the-line printing and industrial-grade production in a front-office friendly package. the external bin or one of the internal bins behind a lockable door. Rimage Catalyst systems feature powerful printing, with the world’s best full-color and thermal monochrome disc printers. Select from Everest® 600 or Prism III™. designed to be easily maintained in any environment. A three-bin carousel handles up to 150 discs, and Catalyst has a 50-disc external output bin. Rimage Software Suite 9.1 included with Catalyst. Options include Blu-ray Disc™ recorders, and a Media Reader. A full set of software tools enabling unique artwork design, job submission, system management, production monitoring and custom application creation. Stacks, duplicates & prints 150 discs unattended with 2 Recorders. Does not Include PC.